Anyways, I figured — why not take some recipes and share them here? I’ve done baked goods for a while, so why not savory foods? Boil the macaroni until al dente. Meanwhile, melt the butter on medium heat and let it sizzle for a while to burn off the water. Then add the flour and whisk together until its a light blonde color — this makes the rue. As soon as that’s done, you can add in the dijon mustard, the bay leaf, and then the 3 cups of milk. Then add in the red onion. Whisk for about 10 minutes, until its super thick and creamy. Then take it off the heat, and temper in an egg. If you don’t know how to do this, visit the Alton Brown website, he has a really good video of it. Basically, you don’t want the egg to turn into scrambled eggs, so you bring the temperature of the egg up slowly. You do this by cracking the egg into a separate bowl first, whisk it, then…while you’re still whisking…add a spoonful of the thick milk mixture into the bowl. This increases the temperature of the egg slowly. Do this one more time, then you can add the mixture back into the original pot. Then add the cheese! So I added pepper jack, then some parmesan cheese — you can’t go wrong with cheese I tell you. Then toss the macaroni in the there, mix it all together and put it in a casserole dish. 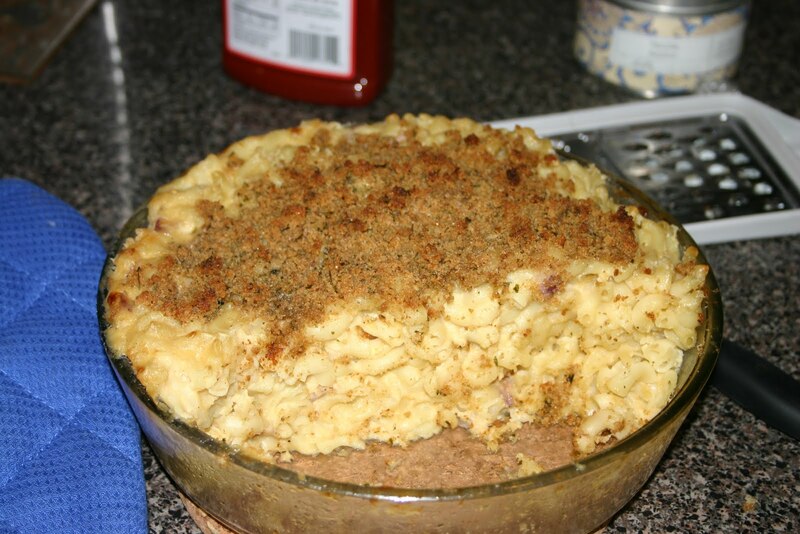 For the topping, mix together the bread crumbs and the melted butter and spread it across the top of the mac and cheese. Bake the whole shabang for about 30 minutes, and it should be ready to serve! Tyler and I tend to eat this with a HUGE spinach salad, but if you just want a meal-in-one, you can mke this dish healthier! You can use whole wheat pasta instead of white, it’s a bit chewier, but it’s still good. You can add in wilted spinach, corn, and black beans — it tastes really good! and for your second recipe — crepes!! 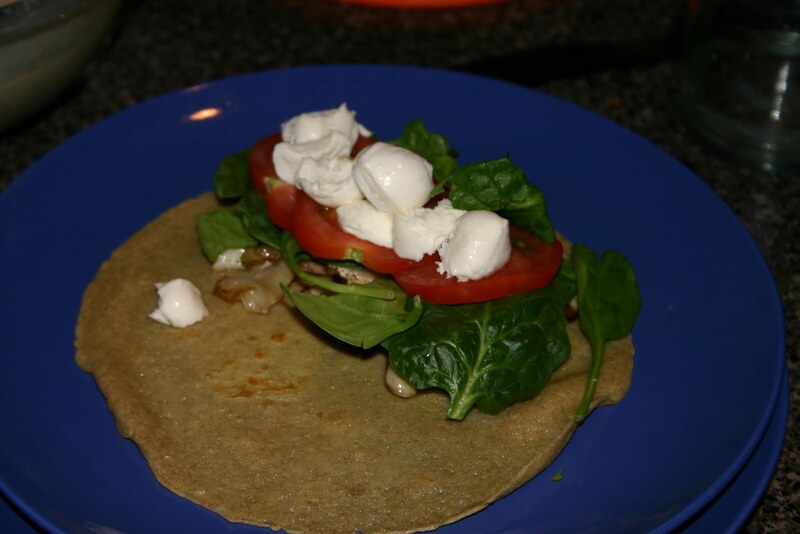 So I think I linked to a website a while back that showed you how to make buckwheat crepes. Anyways, I haven’t made these in a while…when I first started I had an obsession. Seriously. I’d eat these every night with lemon curd and some chocolate ganache…for like…two weeks. Then I got sick of them. Then the other night, I remembered this place Tyler and I used to go to in Davis Square called Mr. Crepes. They were AMAZING!! They had chocolate strawberry banana beautifulness, and mozzarella tomato amazingness, and more chocolate, and more cheese…and GAH…brain food explosion. I miss Boston, can you tell? Roast the fennel with olive oil, salt, and balsamic vinegar in the oven at 350 for 20 minutes. When it’s done, pull it out to cool. Meanwhile you can make the crepes. If you’re going to use a nonstick pan (as I did), just butter the bottom first (you should only have to do it for the first crepe), and make sure its hot before you put the batter on there. Put only 1/4 a cup of batter on the pan and swirl to spread it out into a thin pancake style. Cook it over medium to low heat, and flip every once in a while (the buckwheat crepe website above has a way better description of how to do this — so visit it!). Anyways, when it’s done, put it on a plate, put 1/4 of the fennel down, then the baby spinach, 3-4 slices of tomato, and the mozzarella balls! 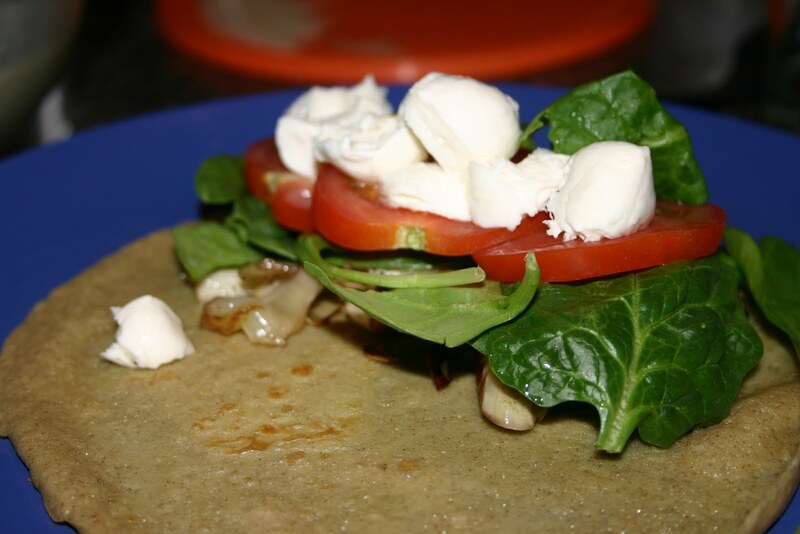 Before you serve, drizzle with a little bit of olive oil and balsamic vinegar…mangifique! These a filling and super tasty!